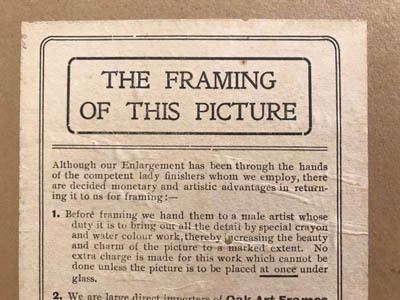 Back when Paul was doing his Batchelor of Photography he needed old wooden frames, so he bought some through eBay. 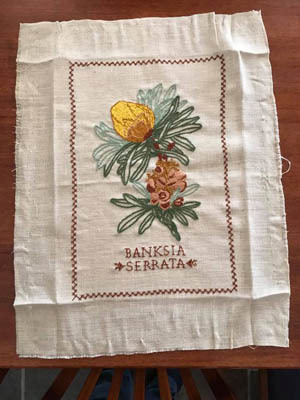 One had an embroidery from 1992 in it. He was going to throw it away, but I figured I could probably make something with it one day. Recently (but probably not so recently that I’m being all that trendy) I noticed there was a fashion for denim jackets with embellishments on the back. I thought about putting that embroidery on the back of mine as a kind of fast, cheats way to get the look. In the meantime, a corduroy jacket I’d bought second hand lost a button. I went on a long and fruitless hunt for a replacement that would match the rest, but it being your typical metal shank button I couldn’t find anything even similar. Eventually I settled on a plastic shank button in my stash that has a pearlescent effect that looks remarkably like the metal buttons from a distance. I sewed it on when tackling the mending pile after my big craft room cull. The embroidery was in my ‘not sure if I should toss or keep’ pile and I decided it was time to decide whether to sew it on my jacket or toss it out. 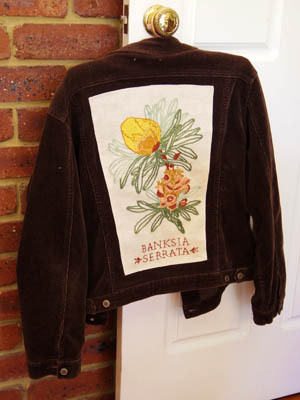 I took out my denim jacket and laid the embroidery out on the back. 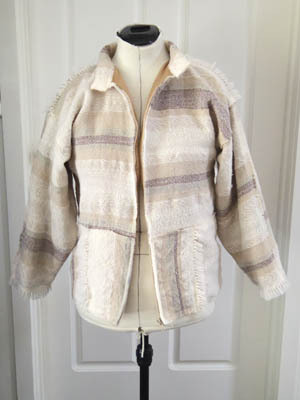 Since it was there I also tried it on the corduroy jacket – and it matched that one better. So I decided to go ahead and sew it on. I’m so glad I did! When I removed the backing board from the embroidery I had quite a surprise. When I had my long bout of finishitis last year, one of the items on the WIP list that I failed to eliminate was the Swimmers Clock. There was simply too many hours of work left to do, to get it done by Christmas. 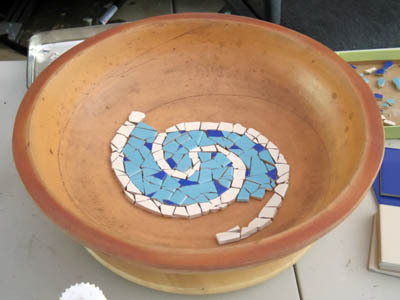 But I did find time to work on it, and my enthusiasm for it and mosaics returned. In the meantime, I started another project: a house number. Seeing Paul with his large tin of obsolete keys, I had the idea of using them in the background. I finished the mosaic just after New Year. The cream tiles are the same type I was using on the clock. However, I ran out of that colour, too. 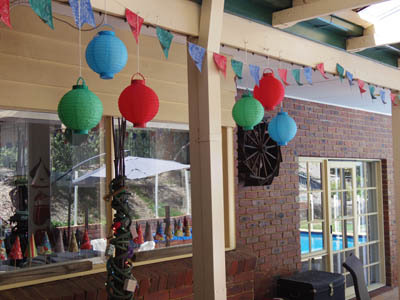 But it isn’t a discontinued colour, and I was able to get a couple from Bunnings. But these did not break as easily or in a predictable way as the old ones. I looked on the back and saw that the old ones say “Made in Britain” while the newer ones says “Made in Malaysia”. Fortunately I was able to finish the mosaic by simply cutting and breaking until I had the right shapes, making a lot more wastage in the process. But I was kind of glad the blue for the clock was discontinued as it would be a much more frustrating process filling in the last of the background. I had bought a bunch of duck-egg blue tiles hoping to just transition into another colour on the clock, but they didn’t match very well and the cutting problem put me off trying with any other colour. Googling, I found that the colour is still available in the UK. I can’t tell from the websites if they are made in Britain or Malaysia, however, so I posted on Facebook asking if anyone knew someone over there who could ship some to me. A few days later, at a party, a friend said the tiles sounded a lot like what he and his wife used on their bathroom. Later he sent a photo, and they do look very much like the ones I need. I just need to get hold of them and see. In the meantime, again, I’ve started another mosaic. I’ve been meaning to tile one of our bird baths, as it has a hole in the bottom that needs filling. 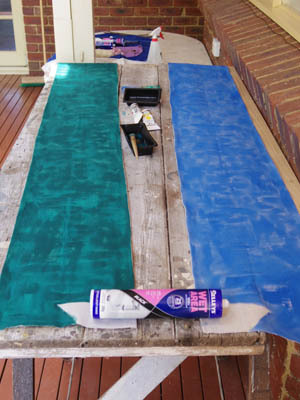 Wondering what I’d do with the hard-to-cut duck egg blue and leftover cream tiles, I realised that if I smash them up with a hammer and use them as random shapes they should work okay. The smaller the pieces, the easier to fit them together. Of course, I then ran out of cream, but that’s okay, I know I can get those ones at Bunnings. Time to sum up what I made in 2018! 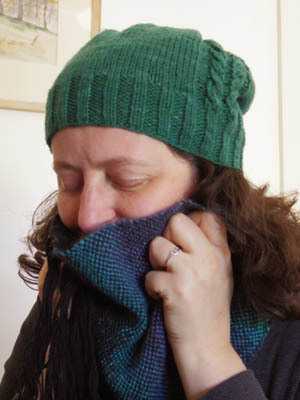 … that led to me tackling two past projects and two wips. 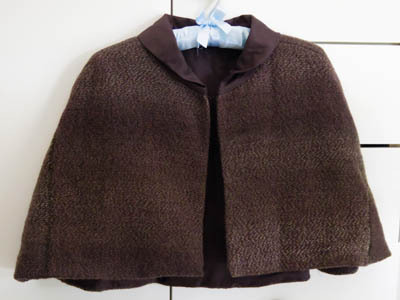 First improving the Glamour Shawl, then turning the Olive Handspun Jacket into the Greta Cape. I finished weaving my first floor rug using rug yarn. 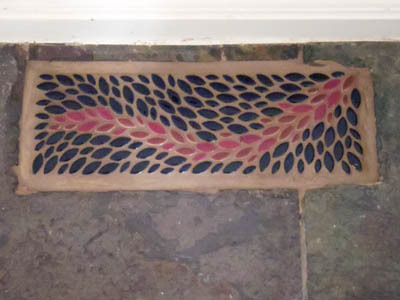 I made mosaic patches for the gaps where the old heating system vents went in the kitchen. 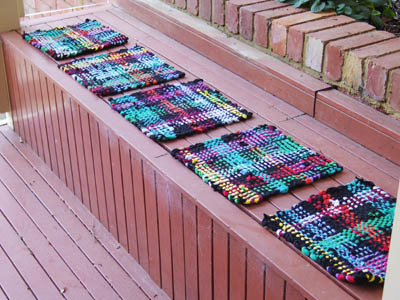 The Kay Plus Fun weaving workshop I’d organised happened, and much shibori fun was had by all. 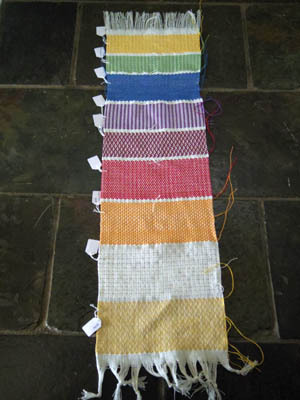 And started a sampler containing all the drafts in the first chapter of Strickler’s A Weaver’s Book of 8-Shaft Patterns. 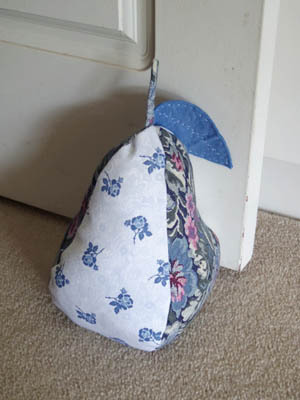 I sewed up a doorstop. 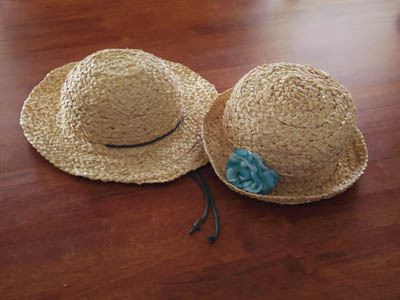 And remade some straw hats. 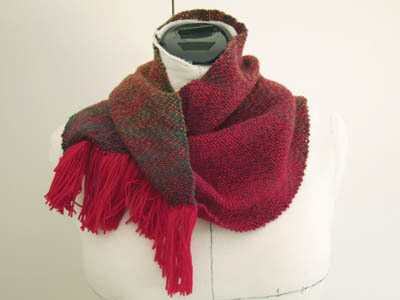 And I finally used the weaving sword to make a cowl. 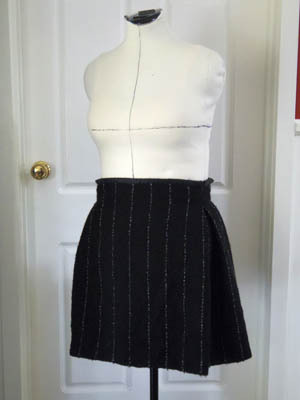 Then finished the Pinstripe Skirt. 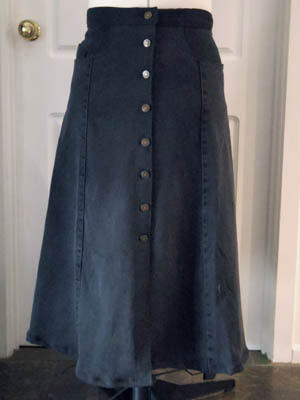 By then I had the sewing bug, and made a black denim skirt out of two pairs of jeans. 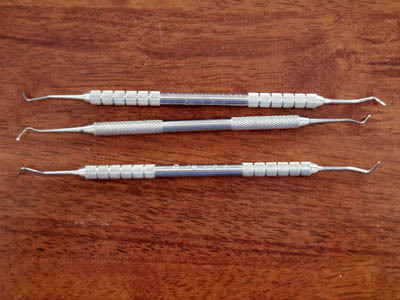 I bought a cheap circular knitting machine, and saw the potential of them so I ordered the two Addi machines. 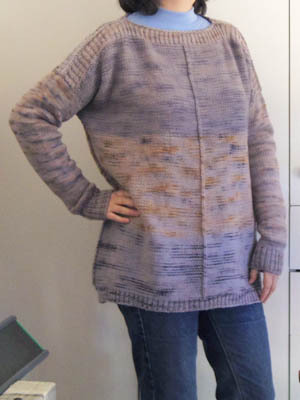 And got the knitting machine bug. 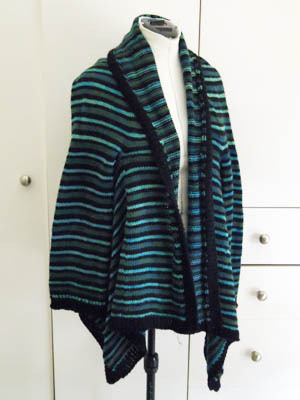 I made the Green Stripes Jacket and Dusk Jumper on the Bond and some scarves and hats on the Addis. I did a stash review and discovered I had waaay too many cone yarns. I decided I had to get my stash down to 35 kilos before the Bendy Show. 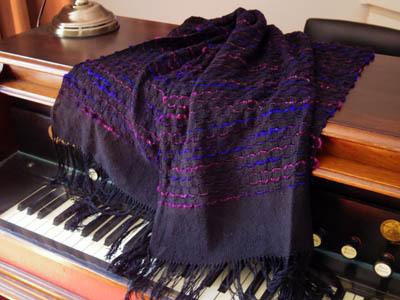 I did manage it, by culling and machine knitting and winding warps. 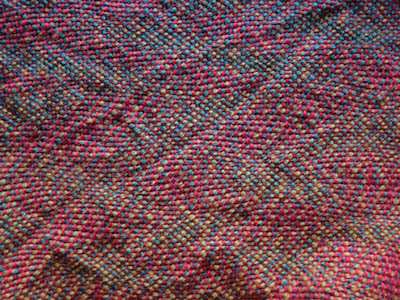 Then I noticed that some of the culled yarns looked great together, so I wove a Stashbuster Shawl. 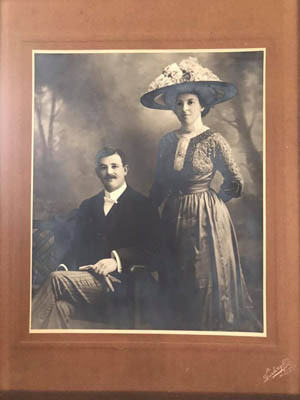 I went to the Bendigo Show. 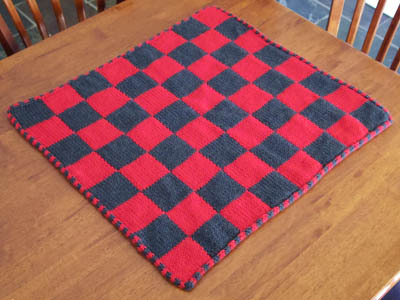 I finished the Chequerboard Rug. The first sampler came off the Katie loom. The War on Waste got me and many of my friends inspired to reduce, reuse and recycle. The Fancy Log Cabin Baby Blanket came off the loom. 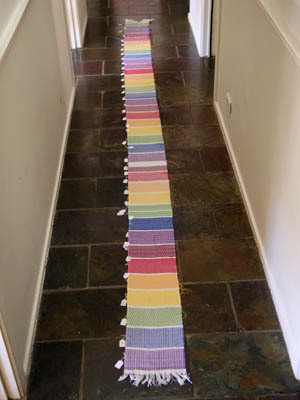 Twill Sampler 1.2 came off the loom. 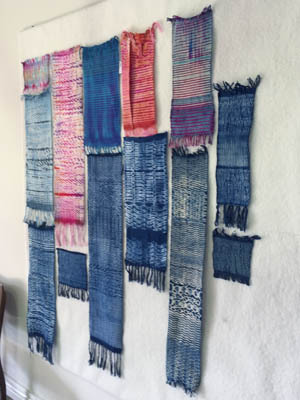 I helped out at the weaving open day. In preparation I’d made an upsized pin loom for weaving rag strips. 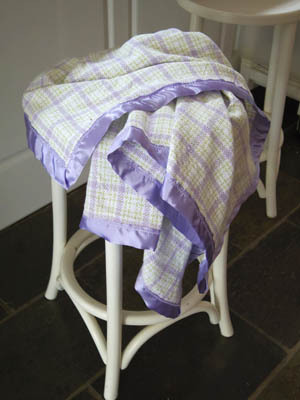 Using it, I went on to weave lots of seat pads. 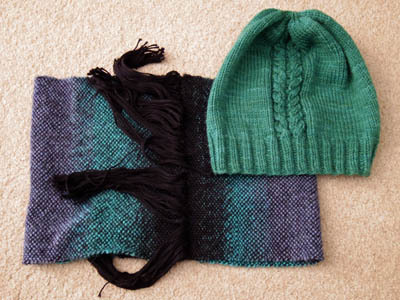 I finished the Gardening Hat and turned a bag I’d woven into a cowl that matched rather nicely. 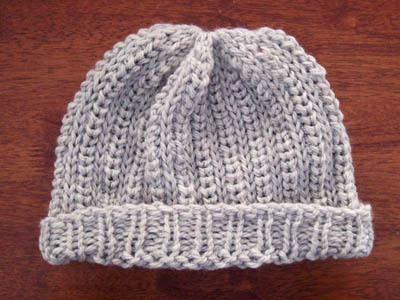 I made a chunky recycled yarn hat on the larger Addi. 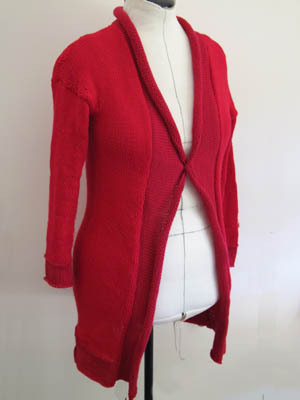 And I finished the Red at Night Cardigan, after many weeks of sewing up. 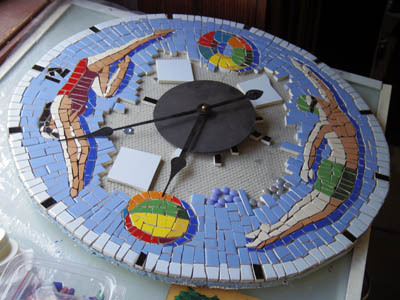 … and started working on the Swimmers Clock again. 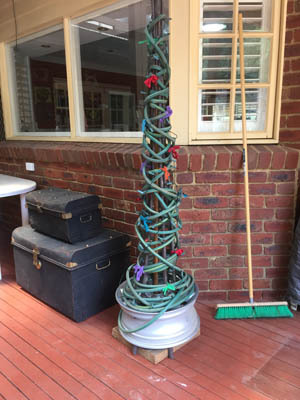 I made a silly Christmas Tree out of a hose, plant stakes and car wheel. 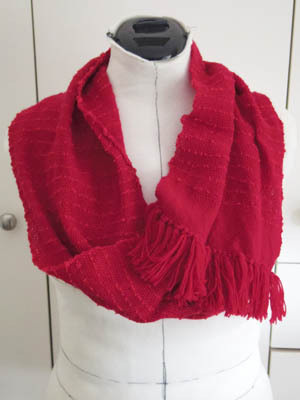 And wove a cowl for a friend’s birthday present. It was a time of much reflection and contemplation… of quitting Facebook and retiring. Still working on the Swimmers Clock, I ran out of blue tiles and discovered they were discontinued. 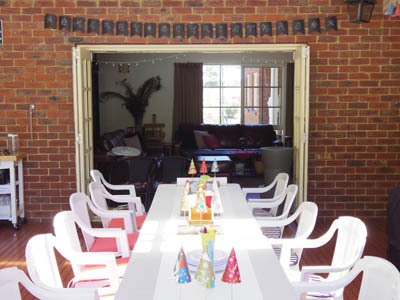 So the only creativity I expressed was in Christmas party decorating, where I made bunting out of drop sheets and ways to display a whole lot of wrapping paper trees made by a friend. 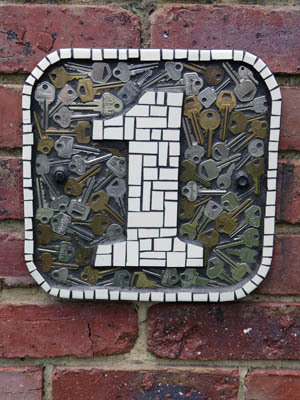 I did start a house number mosaic, but it probably won’t be finished until after New Years Eve. 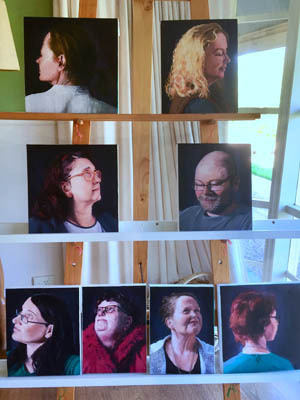 This year, once I finished a couple of larger portraits, I started painting heads-only smaller portraits. I got eight done over the year. 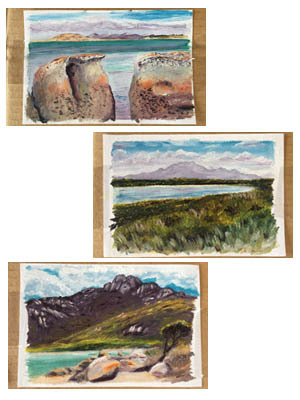 And while I was on Flinders Island I did some painting. I set myself the challenge to buy nothing new when decorating for the event. 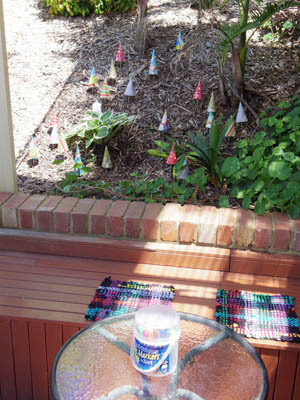 A friend had made a whole lot of wrapping paper cones to decorate an op shop window, and when she heard about my challenge she asked if I wanted them. I said an eager ‘yes, please!’. 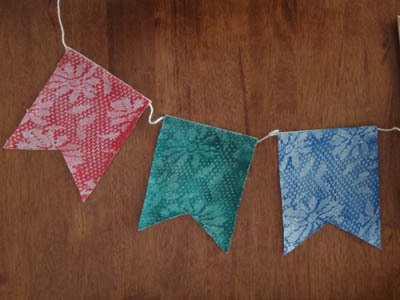 When I was done I cut up the flags and threaded them onto some craft string. Immediately there was something not quite right. The bunting reminded me of car yards. I asked Paul and he said it did the same thing for him. Looking at it critically, I realised two things: the yellow flags made the colour combination too ‘primary school’ and all the colours were too flat. Now we were ready to party. The party went well and one of the first guest to arrive was heard to say “awesome Christmas tree!”. We used reusable plastic plates and cutlery, provided cans and bottles of soft drink to reduce plastic, everyone separated their waste into the ‘recycling’, ‘compost’ and ‘rubbish’ bins I’d set out, and nobody expressed any surprise, let alone a grumble, at it all. Some guests brought gifts in reusable bags, so maybe they are already on board with low-waste. 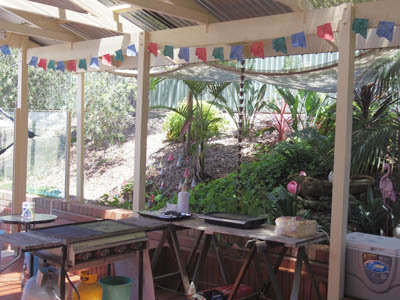 The bunting will definitely be used again – maybe a different colour combination next time – and maybe the Christmas wrapping trees. 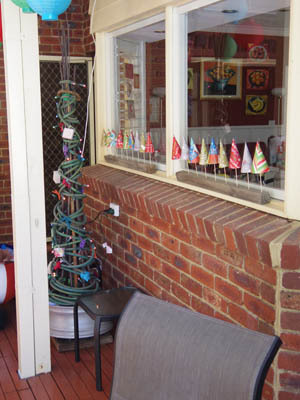 But the hose and stakes tree will be dismantled after New Year. If I need one again, I’m sure I’ll find another creative way around buying something new. I had too much fun not to try again! A few months back a friend surprised me with a lovely small handmade gift for my birthday, so I decided I’d give her something I’d made for her’s. Trouble was, I couldn’t find anything I’d already made that suited her. 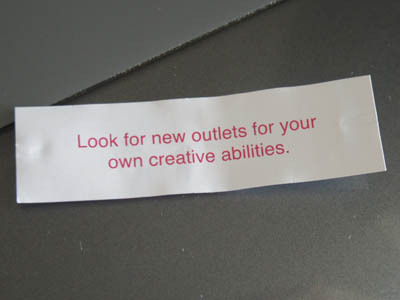 That wouldn’t be much trouble normally, as I don’t usually need a nudge to make something new. However, I’d come down with a virus. Vertigo, headaches and fatigue weren’t exactly helping me find my creative mojo. 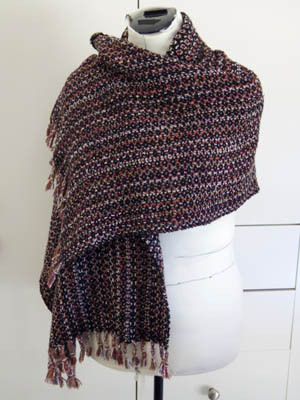 But after a rustle around in the craft room and a flick through a book, I decided to Keep It Simple and just weave a quick scarf out of some graduating yarn with 5ply burgundy cone yarn for warp, using my weaving sword shuttle. 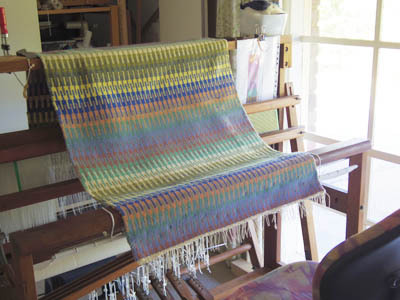 I rather like how the warp and weft interact. The red warp stops the overall effect being too burgundy-ish. It was a good short project, done in a day. 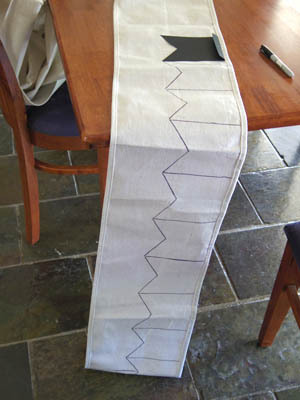 In the meantime, I’ve been slowly working out the specs for a table runner a friend requested. It’s going to require some sampling, as I haven’t seen the particular mix of techniques I’m planning to use. I worked on this piece for a couple of years. It was the project I’d take on trips or work on while listening to a speaker and an event. It was also the test piece I worked on after my eye op. I have to confess, I didn’t enjoy it much. It may be that I didn’t because it hung around so long and I got bored with it. Struggling to work on it post-surgery turned that lack of inspiration to discomfort. 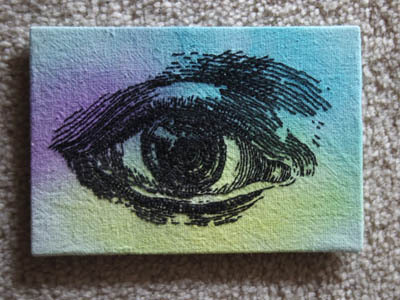 There’s some irony in that my last fine embroidery project is an eye, when my eyes are the reason I stopped. To get the eye finished quicker, I decided not to do the eyebrow and an area of shadow under the eye. The lines were done with the orange-based cleaner on a printout method. I’ve washed these sorts of lines out before, but this time it was hard work scrubbing it off, and I wasn’t entirely successful. Maybe because they’d been there for a few years. 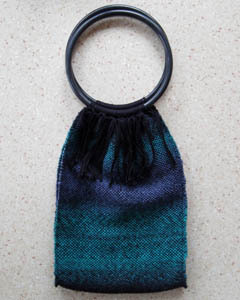 To hide them, I painted the piece with Procion dye while at the weaving retreat. I just need the perfect frame for it.